When Kathy Mast Gerber tackled a project, you could consider it tackled. 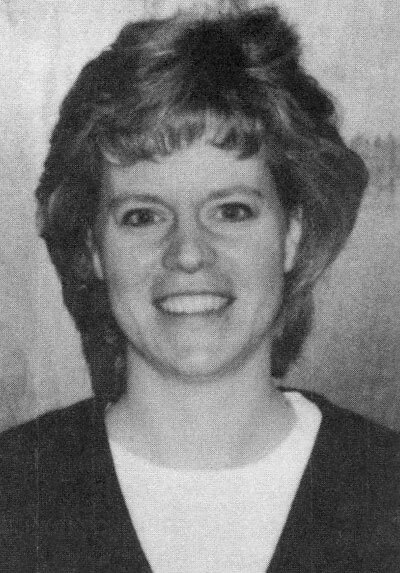 Her tenacity and skill in the sports arena at Smithville High School were rivaled only by her determination to be equally as proficient in the classroom. By the time Gerber departed from SHS, she was not only the school’s career scoring leading basketball and an All-State volleyball player, but class Salutarian as well. Gerber accomplished a rare feat as a senior, earning Wayne County Athletic League MVP honors in both volleyball and basketball for the 1986-87 school year. Then, to show her prep athletic and academic careers were no fluke, Gerber graduated from Goshen College (’91) as the school’s all-time scoring leader in basketball, as well as being an honor student in the college classroom. Deciding which sport to concentrate on was one of Gerber’s toughest decisions growing up. Her prowess as a distance runner was recognized by the time she was in eighth grade, and by the end of her sophomore year she had set the Smithville High mile mark (5:43.5) en route to lettering three years in track. But Gerber’s true sports loves were on the court, where she could share her skills with her teammates. So versatile as a volleyball player was she, that as a sophomore Gerber was selected the team’s top passer; as a junior, the top spiker; and as a senior, its outstanding hitter. A three-year letter winner, Gerber led the Lady Smithies to the league championship her final year and was selected to play in the North-South State All-Star game. Gerber’s play on the hardwood as a senior mirrored her volleyball efforts, her strong all-around play as a scorer, defender and rebounder earning her USA Today and First Team All-State mention while carrying her team into the Regionals. In her final prep game, Gerber canned a tournament and personal-high 41 points to finish with 1,196 markers, a tally she later exceeded while lettering four years at Goshen.